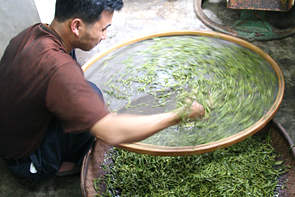 Chinese spring green teas are sold by seasonal designations indicating the time in the spring that the tea was harvested and manufactured. The earlier the tea is plucked the smaller the yield of this tea will be for the year (and the more expensive the tea will be). Early Chinese spring tea is prized by many tea enthusiasts who seek the opportunity to savor the fresh sweetness, or bold astringency that early plucked tea offers. During the course of the year a spring tea will mellow a bit and deliver richer and smoother taste characteristic. A fresh tea that has rested for a few months can often appeal to some enthusiasts more than when it was first brought to market. Spring teas are just that – tea that is made only once a year in the spring. 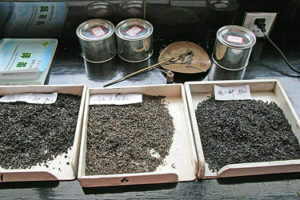 Quantities of these teas is small and the time for their manufacture is often marked by days, not weeks. Hundreds of fragrant, sweet green teas are made each spring in the provinces of Eastern and Southwest China in the harvesting seasons explained above. Some of these teas were once made for the emperors and their court and were known as Tribute Tea. Today, the emperors are gone but the tea workers have never lost the skills to make these fine teas and many of these legendary teas are still being made today. Now these teas are classified as Famous Teas. As you peruse our Chinese spring green tea collection, you will see Famous teas such as Huangshan Mao Feng, Longjing, Lu Shan, Mengding Mountain Gan Lu, and others. In eastern China’s Fujian Province, production of bud-plucked Yin Zhen white tea is from approximately mid-March to the end of March. Plucking for other leafy white teas begins after plucking for Yin Zhen is finished and usually ends about April 10th. The plucking season is early spring ( pre-Qing Ming to Yu Qian ) when the buds and leaves are small and tender. 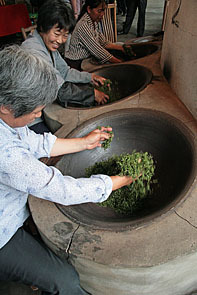 In yellow tea processing, early spring buds or a mao feng pluck ( a bud and two-leaves ) are removed from the heat after the initial firing and covered with a cloth. This unique step is known as ‘men huan’ or ‘smothering’ and it allows the warm leaf to develop flavor by re-absorbing some of the aromatics. This processing gives yellow tea a delightfully smooth, rich, buttery mouth-feel. Today, because of the complexity of yellow tea manufacture, very few yellow teas are still being made. Fujian and Guangdong Provinces produce a treasure-chest full of delicious oolong teas in three main styles: yan cha, dan cong, and semiball-rolled style oolongs such as Tieguanyin. These intensely aromatic and flavorful teas are bursting with juicy flavor, and are plucked in mid-spring (April into early May ) and again in the fall. China black tea, Pu-erh and other Hei Cha are made primarily in the spring – April to May – and again in the fall – September to October – depending on the traditions of the region and the vagaries of the season. But the notion of ‘fresh’ or ‘young’ tea does not apply to black tea, oolong, or Pu-erh and other Hei Cha as it does to green, white, and yellow tea. In China rested and aged black tea, oolong, Pu-erh and other Hei Cha are highly desireable, but this is still a new concept to most Western tea drinkers. For example, many Chinese oolongs are aged to enhance flavor and other teas are best when mellowed for a few months before drinking. Sheng Pu-erh can be drunk young but is traditionally stored for years to allow it to breathe and develop rich, deep flavors. Shou Pu-erh, too, can benefit from aging. Most black teas such as Bai Lin, Golden Monkey, etc, wll keep for several years ( and improve ) as a bit of resting or aging helps soften any astringent edges. 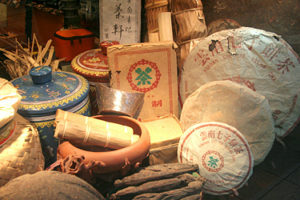 When we can, we purchase Yunnan black teas that have been rested for a period of a year or two. Or we purchase these teas newly made and when the tea shows potential, rest them ourselves for 1 or 2 years before putting them up for sale. We do this because we like the rich, smooth results – we rest other China black teas, too, when we can. Spring is the peak time for new leaf growth after the tea bushes awaken from winter hibernation. These early-harvest Darjeelings are known as 1st Flush teas. Plucking for 1st Flush tea begins as early as the end of February or early March, weather depending, and are followed, weather depending, by the 2nd Flush teas in April and May. 1st flush Darjeeling teas command the highest prices of all Darjeeling tea plucked each year. Darjeeling tea is highly sought after worldwide for its smooth, rich muscatel flavor and fine bouquet. It is often referred to as the ‘Champagne’ of tea because of its elegance and finesse in the cup. The Darjeeling tea gardens are located in the Lesser Himalaya Range of West Bengal in Northern India. The flavor of Darjeeling tea is greatly influenced by the mist-shrouded environment of the tea gardens (which are scattered over the hills and vallerys at 5,000- 6,700 feet in altitude) and the slow maturity of plant development in cool, high-altitude locations. Supremely elegant and lively in the cup, 1st Flush Darjeelings are among our most prized teas. The tea harvesting season in Japan begins in early May, weather depending. The first tea plucked each spring is Shincha. Only a small amount of Shincha is available each spring as the period of time when the tiny, new tea leaves sprout is short. Tea workers race to beat the clock and to harvest the tea leaves before they grow too large to be called Shincha. After the Shincha harvest the 1st plucking of Sencha begins, followed closely with production of Gyokuro, Matcha, and so on throughout the spring season. In central Taiwan, Tung Ting, mid-level elevation grown semiball-rolled style oolongs such as Tung Ting and 4-Season oolong are harvested during April. High mountain oolongs – gao shan – which grow in tea gardens located at altitudes of 4,000 – 8,000 feet and higher, are plucked in the end of May and early June. Taiwan produces some of the world’s finest oolongs. In the north, sweet leafy Baozhong, and Bai Hao oolong come to market in early spring. Taiwan oolongs have two distinct seasons – spring and winter. Spring teas are considered to be the most flavorful and winter teas the most aromatic.